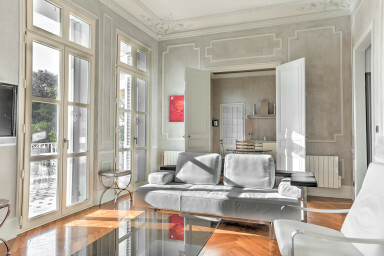 Magnificent 90m ² apartment, located in a secured and closed beautiful residence. It offers all the comfort for an exceptional stay in Cannes. Ideal for delegates (14 minutes walk from the Palais des Festivals) , as well as for tourists (5 minutes walk from the beaches). You have access to the swimming-pool. The living room / dining room with a flat screen has a direct access on south exposed terrace and equipped with a table and chairs. The first bedroom has a queen size bed (180X200) and a nice dressing. A huge kitchen fully equipped with everything you need to prepare your favorite dishes : oven, microwave, fridge, coffee machine, kettle, toaster, dishwasher. The apartment is on the ground floor. The keys and badges will be given to you, on your arrival a person will accommodate you in front of the residence.